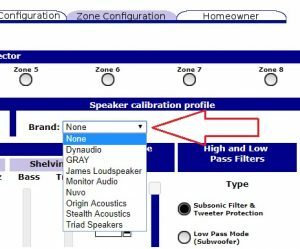 To update the speaker profiles on your Director Matrix amplifier, you will simply need to download the latest file from the product page of the Director amplifier. The file is universal for all Director amps, so you can go to any of the product pages of the Directors to find the file. You will find the speaker profile excel doc at the very bottom of the product page in the download section. You will then want to navigate to the the Director’s web interface and select the device config tab. 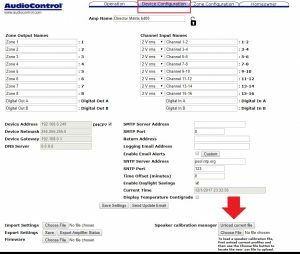 You will first want to unload the current speaker profile by pressing the button in the bottom right corner of the device config tab. 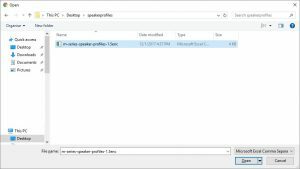 Click on “choose file” to select the latest file, a file explorer window will pop up and navigate to the file that you have saved to your computer. Once selected the file will begin to load. To confirm the upload was successful, navigate to the zone configuration tab. There should now be a section with a drop down menu where you can select the speaker profile you wish to load.